the winner Steve Locker with sponsor Sandy Simpson and vice captain Dave Lloyd………….. The seniors trophy, donated by Sandy Simpson, was competed for by 59 players (55 or over). 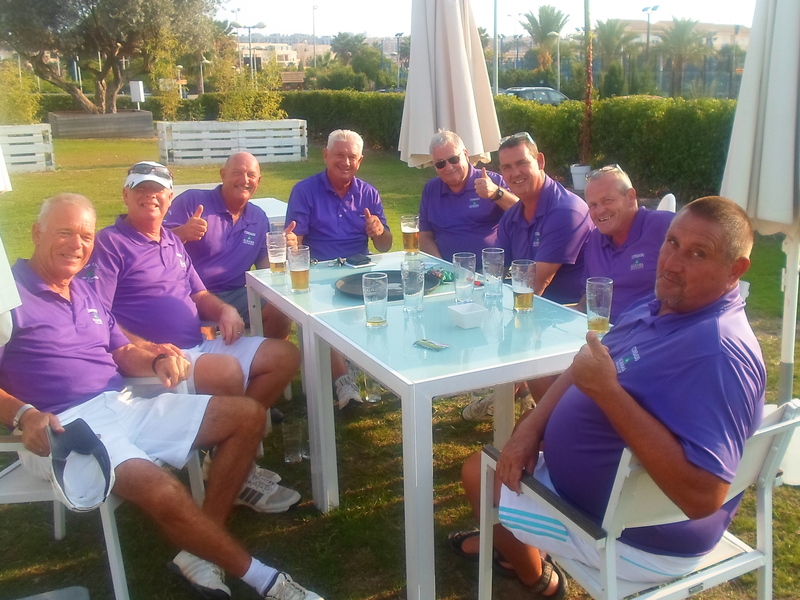 In addition there were a further 16 golfers playing for a stableford prize. 75 golfers is yet another fantastic turnout for the society. This was the last of the major competitions for 2014, so things might quieten down a little now! Helge just missed out on the main prize………..
Jim was nearest pin in 2 on 15…………. Paul was nearest pin on 17…………………. A special presentation was made to Nigel Myers, who holed his tee shot on hole 11 last Monday. Well done Nigel! Nigel had a hole in one on the 11th…………. Dave Lloyd congratulated the groundstaff for presenting the course in such excellent condition. There are only a few bunkers still G.U.R. following the recent rains. Coming up shortly is the Lorca awayday on November 7th, which is necessary as our course is closed to us on that day. We have got a great deal with the cost being 30€ including buggy. A sheet is up in the clubhouse if you wish to go. Also a free bus will be provided from society funds. There is also a challenge match against a Nigerian society tomorrow, Monday the 27th, with a free buffet and entertainment to follow. Anyone wishing to purchase a society sweatshirt (22€) or polo shirt (15€) should see Kevin Smith. Next week is the October Apollo Air individual stableford. Then the extremely busy month of October will be over! Here are the photos of the winners. These are the winners, will post more shortly. Well, the much awaited 5th challenge match between Scandinavia (the Vikings) and UK & Ireland is over for another year, and it did have to go to 3 -2 whoever won. Another close contest was fought between the 92 players, and again it was a close call – this year’s winners are the Vikings! It was a dual format competition, with the best 80% of the individual stableford points being supplemented by an additional 10 points for a win and 5 points for a half in matchplay mode. The Vikings won the matchplay format, but UK/Ireland prevailed in the stableford contest. A close call, where a turnaround in a couple of games which went to the last hole would have seen a different result. Here is the winning team………………………..
this was before the result was announced…………. 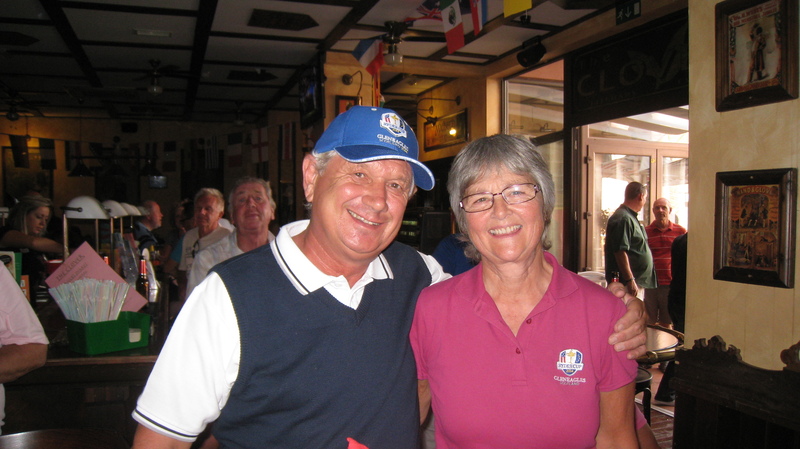 last minute putting practice did not pay off for the UK/Irish team………..
And out on the course………………………..
Barry Answer looked the part in his natty line in headgear, but………..
Karin and Sissel had something to celebrate……….they had the best pairs score……….. Unusually, we had husband and wife Andrew and Torild Lailey on opposite sides – Andrew is English, but lives in Norway with his Norwegian wife…………….. The evening presentation took place in a packed Camposol golf club, limited to 120, although more wished to join in. A lovely meal was followed by entertainment from Sandy Fitzpatrick, and the dance floor was rocking. Thanks to the sponsors, Helge Kristoffersen, Phil Marlow and the Clover bar. Also to IRM who donated a greenfee voucher for 2 players with buggy. Camposol golf club also donated 6 bottles of wine. There was an additional presentation to Graham White, who has decided to stand down from committee involvement, so this was his farewell appearance. He was a founder member of the society, which has come on leaps and bounds from its humble beginnings. I am sure all members will wish him well and thank him for his help over the last few years. The captain, Dave Rollett, presented him with gifts from both the society and his fellow committee members. Graham has been an organiser for the society since its formation……. Congratulations to the Viking team, but the UK/Ireland team will be back next year looking for revenge! I will post the pictures of the players in each match and those of the winners shortly. This week was the 4th and last Dublin Crystal of 2014. The sheet was full almost immediately after last Friday’s competition, and 80 players were lucky enough to get a place in the field (and there was a reserve list!). Thanks to Paul Culligan for sponsoring the 4 events this year. He has confirmed that he will continue his sponsorship next year. The divisional prizes all went to Norway………………..is this a sign? and the ladies winner was Astrid………….. There was the usual 2’s competition with free shots being provided by Neil, but the highlight was not a 2 but a 3 – Stephen Pilley notched a superb eagle at the par 5 9th hole. Well done Steve! Last week we had 30 players go to Aguilon golf for their second ryder cup qualifier. The course was in excellent condition with the greens the best I have seen them. The hole layout on the course has been altered, with the first few holes going right out into the distance and then returning to the 9th at the clubhouse. The second nine has also changed, and the alterations give the course a better flow – however, satellite navigation has not been informed so it was a nightmare uncovering which hole we were on! The patio area outside the clubhouse has been revamped with canopies over to give relief from the sun’s rays. the tricky ravine in front of the par 5 5th makes this a very difficult hole………. the par 5 9th is also protected by a ravine at driving distance………..
Just a couple of pics from Friday……………………..
All 4 of us had horrendous scores, but Ken and Alicia could see the funny side of it at the 17th……………………..
Next Tuesday is probably the biggest event in the society calendar – the trophy we are playing for is ‘The Viking Cup’. Who are the Vikings? What does the word Viking mean? The word is clearly ancient, appearing in both noun and verb forms associated with the Viking age. Yet, its meaning has changed through the centuries. Even today, the word means different things to different people. The runic inscriptions suggest that a Viking was a man who left his homeland for adventure and profit abroad, with the implication that he planned to return home with his newly won fortune and fame. The word existed in both a noun form (víkingr, the person traveling for adventure) and a verb form (víking, to travel or participate in one of these adventures). Even the origin of the word is debated. In the old Norse language, víkingr means a man from vík, where vík may have the sense of a bay, or the specific bay called Víkin in the south of Norway. Perhaps the name was applied because the first Viking raiders were from Víkin, or perhaps because the raiders waited in sheltered bays for their victims. Initially a Viking came from the area which is now Norway, Sweden and Denmark. It was the late 11th century before these countries established their separate identities. The Vikings came and conquered much of Britain and Ireland, so the Brits and Irish now want their revenge! This event will break all records – 23 pairs on each side with modern broadswords and axes (Taylor Made, Ping, Cleveland etc.). So 92 players (and a reserve list!) on a shotgun start, which is the most ever on one society day. The draw for opponents will be made on Monday night at 7.30pm in the Clover bar. Following the golf everyone gathers at the clubhouse for drinks and tapas, and in the evening (which is also vastly oversubscribed) the presentation takes place at Camposol golf club. Who will win this year? the score stands at 2-2 at the moment. Only 3 days later we have the seniors championship (for players 55 and over) – there will also be a stableford for those too young to enter! Paul Briggs is the current holder, and he has returned from the UK to defend his title. There are already a lot of names down so hurry to get your place! On Monday October 27th there is a challenge match between the Condado society and a Nigerian touring team, the sheet is in the shop if you want to be included. A buffet will follow the golf and entertainment will be in the Clover at night. A very busy month with the October Apollo Air stableford to follow on the 31st. golf at a Seve designed course this week………….. This week saw the September Apollo Air competition, which was rained off last month. We had 67 players which included 16 ladies, a very good turnout. Apollo Air have confirmed that they will continue their sponsorship for another 12 months. (see attached advertisement if you require air conditioning). This time out we had a lady winner Jenny Hollis with a very impressive 45 points! Thanks to Kevin Smith who was the starter for the day. After handing out all the cards, he played, and it was a 10 hour day for him (did that include drinking time?). Volunteers for this task are welcome – even if you are half way down the sheet, duties can be split. Next week is the Dublin Crystal individual stableford, not this week as stated in the last blog. At the time of writing there are only 3 spaces left and no more times are available. The colour for next year’s polo shirts and sweaters has been chosen – it is tangerine, which means no one will be able to ignore us! Viking Cup. This is only 10 days away, and the players have been confirmed. 46 pairs in a shotgun start with two games on all tees after the par 5s, and a further match added to the 1st tee. The partners will be chosen by the 2 captains Dave Lloyd and Jan Skjold, and the draw for opponents will be made the night before the competition in the Clover. The format is a combination of stableford points scored and additional points under matchplay. UK and Ireland players remember white shorts with your red team shirt. Tickets for the night presentation at Camposol golf club are limited to 60 for each team. Each player is guaranteed a place, then spouses/partners then the public if there are any left. First to pay Kim or Alicia get priority.There will be 2 buses to transport us to the venue – again the first to pay will get a seat. In last week’s Aguilon Ryder Cup qualifier Peter Ridley is our only player at present qualifying, but there are 2 more qualifiers. Those playing in next week’s qualifier meet at Al Kasar at 09.30 Wednesday. With our course unavailable to us on November 7th we shall go to Lorca. We should have over 32 players which entitles us to a price of 25 euros or 30 euros with buggy. There will be a free bus for the first 33 which is funded by money raised from our weekly raffle of a green fee voucher. This is the 3rd subsidised bus this year after Saurines and Desert Springs, so many members have benefitted rather than the few who would be lucky enough to win one as a prize. The aim of the society is to give back all income from membership in the way that will benefit members the most. Again it is the committee who give their time to sell the tickets otherwise there would be no free bus. This year’s income will be also be used next year for golfing and social events to reduce costs to our members. The diaries for 2015 should be with us soon, but just a pre-emptive warning – there is already a change to the major fixtures. As next year’s captain Dave Lloyd always spends some time back in the UK in summer, he has decided to alter the date for captains day. It will be switched from August to June, with presidents day moving the other way – June to August. This should help members to decide which comps they prefer and book flights accordingly. Just had to share our holiday with you……………………………….. While some went to Aguilon on Monday, several of us went on our annual trip away, (usually to Benidorm) but this year to the fantastic city of Alicante. The boys played golf at Alicante golf on Monday whilst the girls went shopping. A nice Chinese at night was followed by X factor wanabees singing their hearts out in a karaoke club. Don’t expect to see any on your screens in the near future! An amazing bonus we did not expect was right in front of us. In the marina were the 7 entrants in the Volvo ‘around the world’ ocean sailing race. Everything was free, cinema shows, simulated rides, photo shoots and it was very hands on with everyone encouraged to become involved. The professional crews were very approachable and free trips were available on boats around the harbour. Lots of stands exhibiting the sponsors products, a thoroughly interesting and memorable experience. The race started Saturday, and will last for 9 months, calling at 10 different ports where this fantastic exhibition will be replicated. Next stop Capetown! a well earned pint after the golf…………. Dave’s 35 pts was the best by a mile………. those mushrooms don’t half shoot up after some rain……………….. The last of the spanish armada?………………. this ship (restaurant) isn’t in the race!……………. 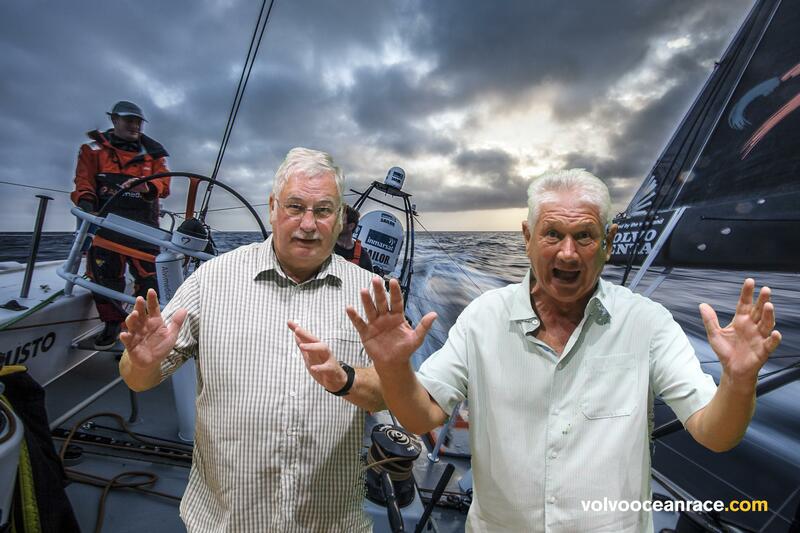 This around the world yacht race is basically the formula one of the ocean…………………………………………. these 7 yachts were in the race……………. Each team has a back-up team workshop………………. Each captain was high profile along the esplanade……………. Exhibition displays were all along the marina…………………….. This is the race mascot………………………………..
kids were encouraged to go out on these dinghies…….. the albatross is the mascot of the event……..
me and Barry Answer on the high seas………..it’s easy, look no hands……..
Another busy week next week…………………..
Lots of work needed to be done by the groundstaff to make the course playable for the 3rd Barry Answer trophy. 56 players took part in remarkably serene conditions, no wind and the first sunshine for several days. Buggies had to stick to the paths due to the recent rains (more the previous night). Barry gave every player a ball on the first tee – many of them didn’t see the 18th! an irish winner this week………. Kim won the ladies division………. Again, thanks to Barry’s wife Denise, who provided some of us with bacon sandwiches and beer – she had to delay her hairdressing appointment until after they had been handed out. She really is a special wife – Barry had breakfast in bed (on her birthday!). Also Barry is very careful with electricity costs. She cannot use the hairdryer because it is too expensive. An exception was made though on Thursday night when they both went for a meal in the port. When they arrived home Barry realised that he had left his golf shoes on the patio, and another deluge had soaked them through! Denise was allowed the use of the hairdryer to dry them out! Barry again put on a special night although it had to be on Saturday in the Clover, as he had set his heart on Showaddywaddy – they were performing in Benidorm Friday. He also provided a fabulous buffet for the players. a new member of the group?…………. Billy won the booby prize on Friday……was this it? Thanks to Sandy and Dorothy Simpson for providing Ryder Cup merchandise for myself and Eli Holdhus. They attended the first day on Friday, flew to Condado on Saturday, so both me and Eli must have been maybe the only people in Spain supporting our team with a genuine cap and shirt on the final day. To add to the atmosphere I took the picture of Seve out of the display cabinet and placed him in prime position to lead the celebrations. proud to support our team…………. and Seve is again leading the celebrations……………. In only 7 days the lakes have been replenished (God has finally smiled down on us). This was the level on Wednesday………………………. 2 days later…. no liner showing………………. water level on 11th back where it started ………. Amazingly the lake on the 4th was empty a week ago………………. The wildlife is returning now we have water……………………………. The staff have been kept busy clearing the paths all week………………..
at the back of the 8th tee………………. The storm created its own drainage channels……………………. adjoining the back tee on 8……….. However, it will take longer to put the bunkers back as they should be…………………..
Due to the state of the bunkers the society has introduced a local rule for our competitions. If the ball is in a water damaged channel within the bunker it can be dropped without penalty (still in the bunker). According to R & A rules the only way you can get relief from an unplayable lie in a bunker is to either drop in the bunker or go back to where you played your last shot (stroke and distance penalty). It is not allowed to simply drop the ball outside the bunker for a penalty. Updated news – although not marked, the head greenkeeper has made all bunkers G.U.R. until further notice. The ball must be dropped (without penalty) outside the bunker, but no nearer the hole and within one clublength of the nearest point of relief (not the best place to avoid going over the bunker!). Next week we go on our October society trip…………. the last 3 years were to Benidorm, but this year is a change to Alicante. We are staying in the middle of the action by the marina, and playing Alicante golf the first day. Days 2 and 3 we will be sobering up…………… hope we don’t get in the state we were in last year! Friday the 17th is the Dublin Crystal individual stableford trophy. Kristin Skjold was the winner last time out. This Friday 10th is Apollo Air. Monday is the first qualifier for the Aguilon Ryder Cup. Only a few for this one as we are in Alicante. 25 euros for playing in one, then 15 euros for also playing in the second or third qualifier. The teams for the much awaited Viking Cup are now posted in the golf shop. 46 players on each side for a shotgun start. We have booked all 28 buggies, so if you want one put (B) against your name on the list so we can organise pairings.